GMFC FF/EMT featured in local paper! Check out the article below about FF/EMT Cassidy Scheibe. The article appeared in this week's printing of the Community Courier! It is also available online at https://www.townlively.com/firefighter-spotlight/. 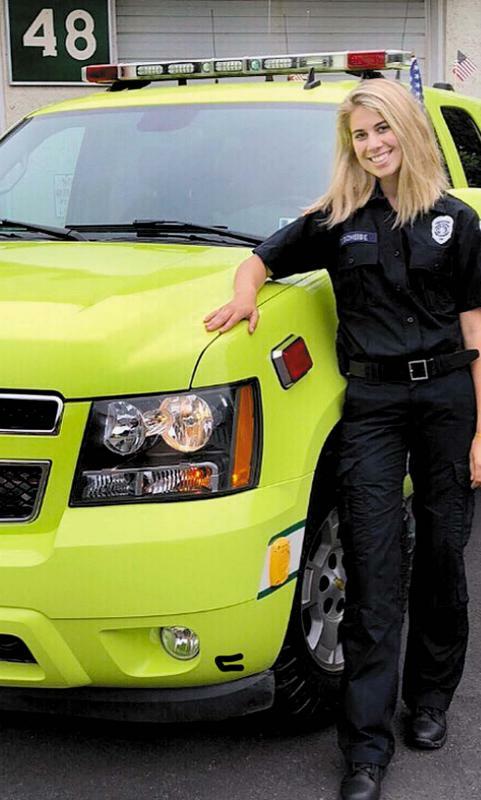 Cassidy Scheibe is a 19-year-old volunteer emergency medical technician (EMT) and firefighter with the Glen Moore Fire Company, Glenmoore, Chester County Station 48. Cassidy is a graduate of the Downingtown STEM Academy, which is Downingtown Area School District's science, technology, engineering and math (STEM) high school, where she also earned an international baccalaureate degree. While attending high school, Cassidy joined the United States Army at age 17 and completed basic training at Fort Leonard Wood, Mo., during the summer between her junior and senior years of high school. Upon graduation from high school, she traveled to Fort Sam Houston in Texas for Advanced Individual Training (AIT) with the Army and completed the demanding 16-week Army Combat Medic course. While at Fort Sam Houston, Cassidy completed her certification as a Nationally Registered EMT (NREMT). Cassidy joined the Glen Moore Fire Company at age 17 and has served as a volunteer EMT, exterior and interior firefighter and Emergency Medical Services (EMS) coordinator. She is fire company's new EMS captain for 2019. In 2018, she completed the rigorous Basic Fire Academy (Fire I) training at the Chester County Public Safety Training Campus. During the basic fire academy program, Cassidy also received certifications in Hazardous Materials Awareness, Hazardous Materials Operations, Exterior Firefighter, Support Firefighter and Interior Firefighter. In addition, she has certificates in International Trauma Life Support and International Pediatric Life Support and CPR. Cassidy is a certified Emergency Vehicle Operator and, along with the substantial number of Glen Moore Fire Company EMTs, responds with the company's Quick Response Service (QRS) vehicle for all medical emergencies in Glen Moore's coverage area. The QRS truck is vital in getting emergency medical care to patients in areas like Glenmoore where an ambulance may be too far away for a quick response to a medical emergency. Cassidy is currently attending college locally while fulfilling her duties as an Army Combat Medic. She works for several local EMS services and continues to volunteer at the Glen Moore Fire Company. Her goal is to become a civilian paramedic. "Volunteers like Cassidy Scheibe are making a difference in the communities that the Glen Moore Fire Company serves and are vital to keeping our communities safe," said Jeffrey Seese, fire chief. "Without their middle-of-the-night responses and hundreds of hours of dedicated volunteer service, our community would not have the high level of public safety it now enjoys." Those interested in volunteering in their community may visit http://www.helpfightfire.com, which is Chester County's volunteer recruiting web page. Those who visit the website can learn about volunteer opportunities in their local communities. Firefighter Spotlight will be a regular feature in the Community Courier. Local fire companies that wish to submit a photo and biography of one of their members can email ffulton@engleonline.com. FF/EMT Cassidy Scheibe with the QRS 48 squad vehicle.